New Delhi, March 2: Indian Air Force's Wing Commander Abhinandan Varthaman on Saturday briefly spoke with Defence Minister Nirmala Sitharaman about his captivity ordeal in Pakistan. According to sources, Wing Commander Abhinandan Varthaman told Sitharaman that he was subjected to mental harassment during his nearly 60-hour captivity in Pakistan. He was released on Friday amid mounting international pressure on Islamabad. Sitharaman met Abhinandan at the Army’s Research and Referral hospital in New Delhi. During their meeting, Varthaman briefly mentioned to Sitharaman about the mental trauma he was subjected to during his captivity in Pakistan, sources told news agency PTI. "He is mentally strong and remains in high spirits despite the harassment he suffered in Pakistan," they said. He also said that h he was not physically tortured, they added. Pakistan Lie Busted Again! Lockheed Martin Not Suing India For Claiming MiG-21 Shot Down F-16 Fighter Jet. According to a spokesperson of the Ministry of Defence, Sitharaman conveyed to the IAF pilot the sentiment of the nation and appreciated his “impeccable combat skills as well as calmness in adversity”. 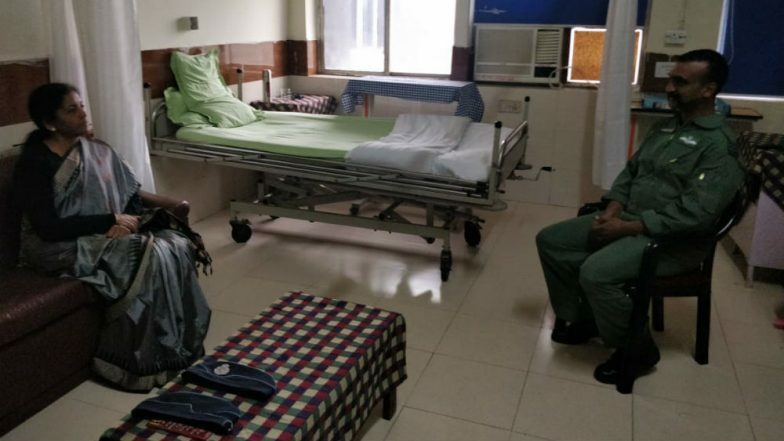 After his return to India, Wing Commander Abhinandan was first taken to the Air Force Central Medical Establishment (AFCME), a compact and specialised medical evaluation centre for aircrew of all the three services. Later he was brought to the Army’s Research and Referral hospital. He was roughed up by locals before Pakistani personnel took him into custody on Wednesday. During his captivity, Wing Commander Abhinandnan showed courage and grace in handling the most difficult circumstances for which he was praised by politicians, strategic affairs experts, ex-servicemen, celebrities and people in general. Pakistan Claims It Has Taken Over 'JeM's Nerve Centre', Says Won't Let Its Soil to Be Used For Terrorism Against Any State, Including India. He is undergoing a series of medical tests at the hospital as part of a 'cooling down' process. Tensions escalated between India and Pakistan after the IAF conducted a bombing on terror group Jaish-e-Mohammed’s biggest training camp near Balakot deep inside Pakistan early Tuesday, 12 days after the Pulwama attack. Pakistan retaliated by attempting to target Indian military installations on Wednesday. However, the IAF thwarted their plans. Abhinandan's MiG-21 jet crashed during the aerial operation. He downed an F-16 fighter jet of Pakistan Air Force by firing an R-73 air-to-air missile before his fighter jet was hit. After the crash, he landed in Pakistan-occupied Kashmir. He was chased by a mob and later rescued by the Pakistan Army. The Indian Air Force's pilot was in Pakistani captivity for over 60 hours before his ordeal came to an end after several hours of uncertainty on Friday.